Whether or not Green Bay Packers President and CEO Mark Murphy should have waited until the end of the season to fire Mike McCarthy as opposed to his doing so after last Sunday’s 20-17 loss to the Arizona Cardinals is still being debated. But Murphy admitted during a news conference on Monday that Sunday’s listless performance was the last straw and a move had to be made. Contrary to what has been widely reported over the last several weeks, Mark Murphy said quarterback Aaron Rodgers didn’t get Mike McCarthy fired. Rodgers was asked on Monday if he was the reason for Mike McCarthy’s dismissal. Murphy also made it clear on Monday that Rodgers would not have a role in picking McCarthy’s replacement either. The majority of the players that were available on Monday said they expected McCarthy to be fired, but they didn’t think it would come until the end of the season. Murphy and General Manager Brian Gutekunst will work together on the hiring of the next head coach, but the final say will remain with the Packers’ President. Murphy changed that structure when he hired Gutekunst. 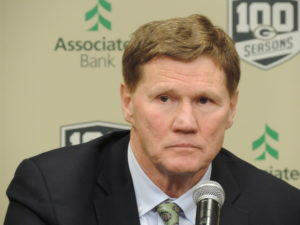 But Murphy told reporters that he would not hire a head coach that Brian Gutekunst didn’t support. Murphy didn’t offer any thought on the type of coach he will be seeking but did say that interim head coach Joe Philbin would be a candidate for the position. Continuous questions were directed to Murphy over the structure, he said his hiring of the head coach is in the best interest of the organization. The Packers will play out the string with Joe Philbin in charge. It starts with Atlanta on Sunday at Lambeau Field. Murphy said the Packers won’t have a replacement for McCarthy before the end of the season.